Do you all love cranberries as much as I do? They’re sweet and tart and oh-so-versatile and really pretty little things, too. We always had cranberry sauce (from the can. Best. Stuff. Ever.) at our holiday get togethers, and I’d be lying if I told you that I only ever had one helping. 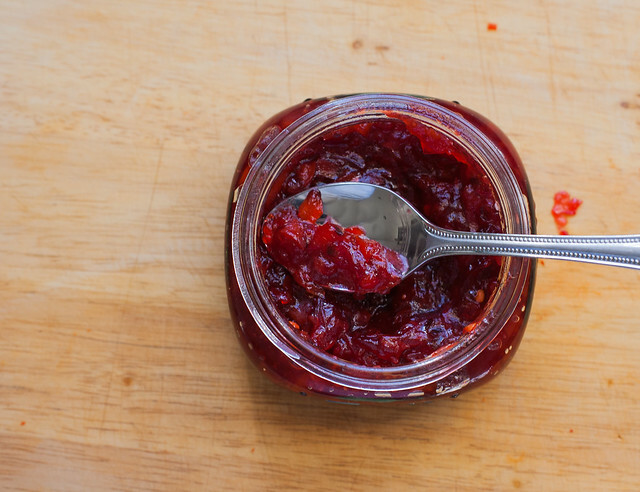 This year for Thanksgiving I tried a homemade “canned” cranberry sauce recipe that turned out beautifully, if I do say so myself, and I plan to share that with you in just a few days, but right now I’m kind of obsessed with this stuff: Cranberry Pepper Jelly. It was the simplest jelly to make – I spent about 45 minutes on it yesterday – and even though the ingredient list is (perhaps oddly) lacking in spices, flavor-imparting liquors, or other such things, it still manages to pack a knockout punch of tart-sweet-hot that will blow your mind. I found this on the Bon Appetit Thanksgiving App (aside: At first I was like, Really, Bon Appetit? Do we really need an app for that? Turns out: Yes. Yes, we do. It’s a wonderfully concise collection of holiday recipes that runs the gamut from traditional favorites to modern twists, and my OCD mind loves their genius organizational scheme.) in the Southern Menu section. Folks down here love to serve pepper jelly over cream cheese as an appetizer and I see no reason to fix what ain’t broke. My guests for Christmas Dinner will be arriving in the afternoon a few hours before the meal is set to begin, and my ancestors would no doubt do some of that much threatened “Rolling Over in Their Graves” if I didn’t have something for my partygoers to nibble on in the meantime. Another plus for this one is that it doesn’t require any canning. I put mine in a wide mouth pint jar for easy dipping, and according to the recipe it will keep for 3 weeks or so in the fridge. But, really, good luck with that. I couldn’t find red jalapeños in my neck of the woods, so I bought “Red Chiles”. Which, in my experience, could range in flavor from bell-pepper-mild to habanero-hot. Mine were on the hot side, which is what I was going for to balance out all the sweet-tart from the cranberries, but I think this would be an excellent area in which to experiment if you were so inclined. Although I would recommend sticking with peppers on the red side of the spectrum so as not to muddy up the lovely color of the jelly. I’ll be serving this over whipped cream cheese with some sort of very elegant cracker (ahem. Triscuits anyone?). 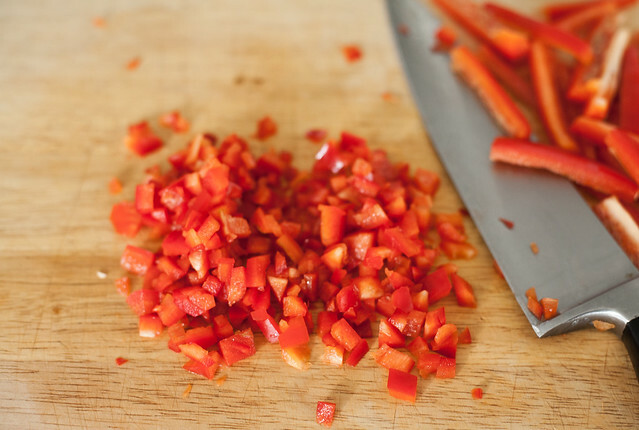 Combine peppers, chiles, sugar, red pepper flakes and salt in a heavy wide pot over medium heat and bring to a simmer, stirring to dissolve sugar. Stir in pectin and lemon juice. Reduce heat and simmer gently for 10 minutes. 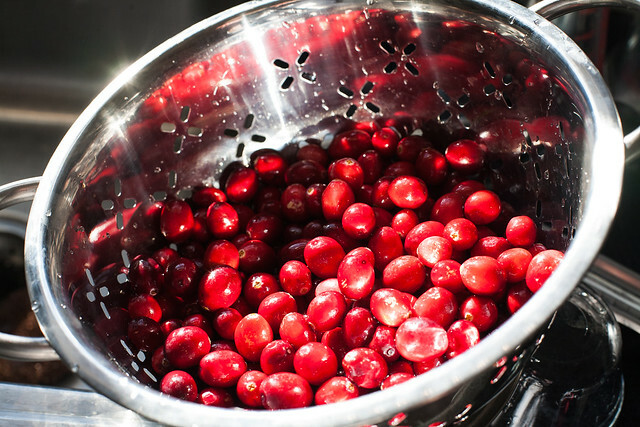 Stir in cranberries and simmer gently until they burst and juices thicken, about 10 minutes longer. Transfer jelly to a jar, let cool, and cover. Will keep for up to 3 weeks in the refrigerator. Makes about 1.5 pints. It’s beyond awesome. My new favorite thing to put on a cracker. Or a spoon. Ahem. Yes, a spoon. That would be my favorite way of eating all jams and jellies. I never get around to the crackers, lol! Hello from Prague, btw! G and I just arrived a few hours ago and will be making our way to Austria Sunday morning. I’ll have to see what interesting goodies I can bring back! How fun! Enjoy your holidays!